Ellen Feiss attended and participated in the gala, and later spoke to Public Movement’s leader, Dana Yahalomi, about the project’s intentions and outcome, its ongoing implications, and the problems around critique in artistic practice. Ellen Feiss: Can you briefly describe the gala? Why were various interludes (a Bosnian Choir, belly dancers and a classical guitar performance) included? How were they intended to interact with or augment the central undertaking of the gala: the presentation and voting on a re-branding strategy for Europe’s Muslims? Dana Yahalomi: The gala was part of an Austrian national celebration in 2012, which marked the hundredth anniversary of the historic recognition of Islam as an official religion in Austria, the first European country to have done so. As one event among many elegant dinners and conferences that took place throughout the year, Public Movement’s gala suggested an alternative approach to the celebration of a historic anniversary – one that looked beyond the purely ritual purposes of these kinds of events into the constructive potential they carry – an anniversary that not only commemorates a moment in the past, but reactivates it within the present to recognise the repercussions it had, and continues to have, for identity formation. The different performative elements of the gala – politicians giving opening remarks, branding strategists pitching their campaigns, Muhammed Asad’s speech, Austrian belly-dancers, the Bosnian choir and even the gala itself – were juxtaposed to create overt and covert conflicts, and to transgress the typical appearances and settings of these kinds of performances. EF: What was the rationale behind choosing these three particular branding agencies? DY: The agencies were chosen to represent three distinctive approaches to branding. DMB, which is the largest branding firm in Austria, represented a mainstream, corporate approach. Their campaign, realised as print advertisements and billboards, used a typographical trick to compel the viewer to ‘look again’ at what they consider to be Islamic. What first appears to be Arabic script, upon closer inspection, is in fact German text reading ‘look again’. Guleed Mohammad, one of the founders of Love Tensta, is both a branding consultant and a community organiser, as well as a second-generation Muslim Somali living in Tensta, Sweden. Unlike the other presenters, he never went through professional training in branding or design. He represented unconventional branding methods, based on personal relationships more akin to a form of activism. His campaign proposed that every individual in Europe change their name to Muhammad or Fatima. Metahaven is a theory-oriented design studio, which works closely with the art world and is invested in analysing and experimenting with the act of branding. They proposed the production of images and slogans, to be posted on the internet over the course of a year, which took aim at the rise of right-wing, xenophobic political parties in Europe, such as Golden Dawn in Greece, and was intended to go viral. Unlike most branding briefs, those I gave the agencies did not specify political or ideological lines for the campaign, nor stated a desirable outcome for it. The experiment was to see how an ‘artistic’ brief based on social, historical and political research can effect the act of branding a community. EF: As a performative research body, what information did you gather from the gala? DY: One of the most striking realisations was that left-wing art-world discourse is governed by a reiteration of the post-colonial question: who is eligible to speak, about what and on behalf of whom? There was regular criticism of the project on the basis of my Israeli passport, as if things would have been less problematic if I was myself a European Muslim. In fact, other sets of problems would arise. The role of the nation-branding consultant is often of an outsider. Similarly, the philosopher and the artist traditionally aspire to offer an outside perspective. The limited debate around which statements and actions can be made, and by whom, suggests another unspoken infrastructure of roles and authorities. The experience of this project reaffirmed that artists have leverage when participating in official events and national celebrations. In terms of the production, Rebranding European Muslims required putting together many discordant parts and creating an unusual combination of performers – a moderator, branding firms, musicians, politicians – some of whom, like the belly dancer and the Bosnian community choir, normally refuse to be associated with one another. The process cast the artist as a diplomat, or a political consultant. The search for a moderator was the most challenging aspect. It took five months of negotiations with a series of public figures, all of whom expressed ambivalence and fear of being associated with the project. Their attitudes reaffirmed a prevailing reluctance toward the subject as something that is ‘better left untouched’. EF: It seemed to me there was an intended winner: Metahaven, or at least that this agency was clearly situated as the only option that addressed the double bind of the task at hand; that any sincere attempt to re-brand ‘European Muslims’ casts aside the history of power relations at play in the formation of the political subjectivities – European Muslim as well as secular European – that create the contemporary conflict assisted by any re-branding ‘solution’. Watching the gala was a conflicting experience; I was trying to identify your gesture within the performance, whilst feeling increasingly uncomfortable on behalf of the audience­. Hearing people who I generally agree with explain why they voted for DMB, and feeling the tension of the encounter – the awkwardness created by disagreements being aired unexpectedly – this effect seemed, if not your intent, to clearly be an outcome that could have been anticipated and thus part of the motivation for the gala. How do you feel about the outcome of the vote? DY: Metahaven were not the intended winners; there was no intended winner. But I guess it all depends on how you understand the act of branding. The visionaries would say it is to modify the norm. When asked to rebrand tobacco, instead of coming up with new packaging, public relations pioneer Edward Bernays aimed to overturn conventional perceptions of smoking, thus introducing cigarettes to a vast new market consisting of more than half of the population: women. Along the same lines, we tried to stage the gala in such a way that participants would understand themselves as having agency over the images and preconceptions we consume. Naturally, this process is uncomfortable. EF: There are clearly several audiences for Re-Branding European Muslims, as with Public Movement’s other works such as SALONS: Birthright Palestine? But was there a primary audience in mind? DY: Our aim is to use the infrastructure of the art world to create social impact. To do this, it is vital to reach out to different groups and so create new publics composed of parties who would not normally appear in the same room together. Our project SALONS: Birthright Palestine? involved left-wing intellectuals, human rights lawyers, UN consultants, Birthright Israel alumni, Jewish community members, Zionists, Palestinians, artists and journalists in a series of public debates around the question of a Birthright programme for Palestine.1 In Graz, thanks to the networks of Steirischer Herbst, we could reach many different experts on the subject. I worked in close collaboration with members of the local Muslim community in preparation for the anniversary celebration, one result of which was a significant attendance of Muslims at the gala, probably more than in any other event in the history of Steirscher Herbst. EF: Is there an ‘informed’ audience for Re-Branding European Muslims? By this I mean voters who are pre-disposed to voting for an agency such as Metahaven, either because they are politically engaged along similar lines, or ‘informed’ in the sense that they are familiar with your practice and your concerns as a performative research body. I ask this because I think your critique was lost on the vast majority of gala participants – what is the function of the piece if most viewers never become aware they are part of it? Is this productive? Or more importantly, what kind of production is this? “Productivity”, in the context of an art project, is not an easy thing to measure. Public Movement’s position is that creating arenas in which the public can perform as a political body, engage and debate social trauma and political ambition, and embody ideological conflict on the level of their individual experiences, is productive because it creates an intimacy with issues that are normally kept at a distance. ‘Productivity’, in the context of an art project, is not an easy thing to measure. Public Movement’s position is that creating arenas in which the public can perform as a political body, engage and debate social trauma and political ambition, and embody ideological conflict on the level of their individual experiences, is productive because it creates an intimacy with issues that are normally kept at a distance. I will add that when you are trying to make political interventions, you cannot stay in a comfort zone, such as the Left, where you are presumed to reside as an artist. You have to risk getting politically ‘dirty’ – and in my opinion, the focus on ‘critique’ rarely amounts to this. EF: Was the gala a critique, however, of representational democracy? Could you comment on the choreographed voting system? It was a stunning visual operation, which also functioned to make everyone aware of who their peers and dinner dates had voted for. DY: The voting system was designed to intensify the act of voting as a form of public ritual. More than a critique, or a comment, it was a gala, or rather a suggestion for a new gala format, one that brings debate and shared decision-making into ceremonial events. I’m hoping that the galas and ceremonies of the future will adopt this model, in which conflict, discord and common interests can be elegantly choreographed. EF: I’d like to talk about the various mobilisations of tolerance in Re-Branding European Muslims, which I think was both the gala’s most successful achievement and, arguably, a harmful production of the work. You discussed tolerance as an evil in relation to the project in your interview with Daniel Miller,3 but what was produced, the campaign by DMB, is a form of tolerance. The campaign is a visual and textual script, both practicing tolerance itself and calling upon its viewers to relate to an Islamic Other through its particular method of tolerance: ‘looking again’. I’m referring to the notion of tolerance Wendy Brown has developed where she defines tolerance as a form of governmentality, a political rationality which facilitates and legitimises practices of governance.4 She specifically addresses the location of tolerance in relation to Islamic identity and Islamic states during the ‘war on terror’, and situates tolerance discourse as linking the governance and control of identities of difference within the US (difference in terms of sexuality or ethnicity for example) with its counterpoint in US imperialism. Tolerance, in Brown’s discussion of it, de-politicises the most political of conflicts and, in a very real sense, provides a highly flexible cover for the most intolerant of policies, i.e. the punishment of ‘intolerant’ Islamic individuals and societies. I would argue that both Guleed Mohammed and DMB’s campaigns were overt expressions of tolerance and, most dangerously, fresh, re-tooled programmes for practicing tolerance. The winning entry, a veritable bio-political call to tolerance in its invocation of patiently finding the European within the Islamic, will now be released into the EU. At the same time, I do think that the gala was a critique of tolerance, starting with the event as marking the centennial of Austria ‘sanctioning’ Islam. Did the gala ‘re-politicise’ where tolerant forces undercut conflict? Here I return to my previous question: where was the reinstallation of conflict if more than half the audience was unaware of the critique? DY: Guleed Mohammad’s proposal clearly sought to complicate notions of tolerance and reject the notion that group branding can be done in any way other than by undoing and disempowering a brand’s association to a group, in this case, the ‘brand’ Muhammad. I think Guleed’s proposal went a long way beyond tolerance by asking individuals to become personally involved in the process of (un)branding and be willing to change their name. If it had won, his proposal could have developed in surprising ways. It is worth noting the specific situation to which this proposal responds; in Austria, if you want to change your name from Muhammad to a non-Muslim name it will cost you 14.50 euro, and you would not need to give an explanation. But if your name is, for example, Maximilian and you want to change your name to Muhammad then you must either provide conversion to Islam as the reason, or pay an increased fee of 560 euro. If Guleed had won the vote, we would have been compelled to mount a legal challenge to this on the basis that not only religious reasons but also political and social forms of activism should have the same privilege of the lower price… That said, I absolutely agree that DMB’s campaign restated a discourse of tolerance. EF: In relation to the potential of Guleed’s project that you point out, how do you feel about the relationship between what occurred in the gala itself and the larger potential of the event? I think this is true for a lot of performance-based practices; there’s a tension between this potential for what could have political effect, what could transpire after the event and what in fact happens. How do you feel about that? EF: Brown discusses the ‘scene of tolerance’ as naturalised – that tolerance is always presented as a ‘non political’ practice of proper Western conduct in acting upon its Other. In this regard, I see the gala as the presentation of a ‘scene of tolerance’ that is de-naturalised and made visible. For most voters, however, the scene and its various mobilisations of tolerance were left invisible. While I understand that you don’t feel it was the point of the piece for everyone involved to be aware of this critique, what does it mean for you, as a performative research body, to critically add to tolerance discourse? If you take responsibility for what was produced, do you see Public Movement as a purveyor of power? I’m interested both in how you feel about this ethically, and also what you think about the actual product of what you’ve created and what you think it does or will do. DY: I disagree that the tensions around questions of European tolerance were left invisible; I believe you sensed it in the room, in the uncomfortable atmosphere you yourself describe. There are different ways this tension can perform itself, and it is not limited to being made apparent only by being announced. The gala wasn’t about reaffirming the participants’ own ethical position, it was about creating a space for its reconsideration. As I see it, the outcome of the vote was one component among others in an informed choreography of juxtapositions. As I said, many conversations before and after the gala centered on the question of my own eligibility, as a Jewish Israeli, to initiate such an event. The morning after the gala a curator I know extremely well told me she thought the whole project was highly interesting, that it suggested a truly new format for both art and performance art. And then she added, ‘but only if it was made by a Muslim!’ She claimed that it is fundamentally wrong for a non-Muslim to even suggest the title Rebranding European Muslims. Similarly, the work on SALONS: Birthright Palestine? aroused controversy over our right to bring up the subject at all. In other words, ethics of representation are central to our investigations, but I totally reject the notion that artistic and theoretical discourses have to pass through checkpoints divided along religious and national lines. EF: In relation to that, I think you’re right in proposing that I’m over-emphasising the critical aspect of the gala and overlooking its organisation of disparate publics as a new form of visualising political conflict – but I keep coming back to this question of the material that has been created. 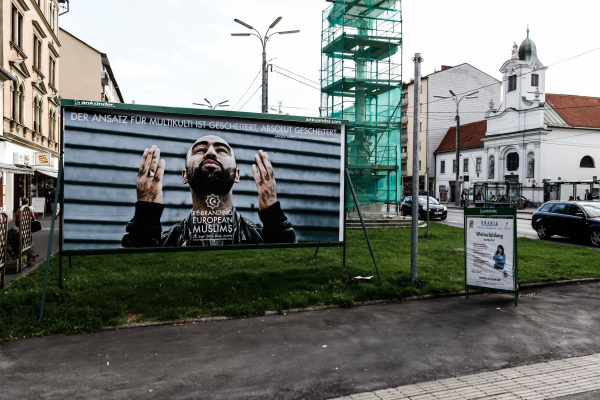 How do you feel about the breakdown in communication, where the critical experience of the gala is separated from what is subsequently presented, on billboards in Graz? I keep coming back to this question of the material that has been created. How do you feel about the breakdown in communication, where the critical experience of the gala is separated from what is subsequently presented, on billboards in Graz? While on the one hand this is a necessary aspect of the project, on the other hand you’ve added to the discourse in question. The billboards also function to maintain an informed public – one which is aware of the problems the gala took up ­– in opposition to a general public, who experience DMB’s campaign as it is. DY: I accept this criticism concerning the material outcome of the project. I think there could have been other uses/displays of a winning campaign but, as you mentioned previously, the desire to see the familiar often controls public space and public discourse. While saying that, Rebranding European Muslims can be considered a branding campaign, situated around the question: What is the future of European citizens? Rather than focus on DMB’s winning campaign, consider how the project as a whole was nominated to Austria’s national branding competition. Branding today extends beyond an image and a slogan, both in terms of the use of branding (greenwashing, pinkwashing and so forth)5 and in terms of what campaigns look like. The media coverage of Rebranding European Muslims and its official position as part of a national celebration marks it as successful. EF: I completely agree. On the other hand, I think it’s inevitable that DMB won and I can’t imagine a situation in which they wouldn’t have. They won by a huge margin. DY: Why do you think this? EF: DMB represents what ‘branding’ is understood as – when you asked the audience to ‘brand’ European Muslims, what was chosen was a straightforward answer to your question. This is an inherently political problem and a problem that relates to a representational model of politics. That, as a citizen, there are multiple questions being asked of you and by voting you can only respond to one of them. The gala highlighted this problematic powerfully. The ethical question here is that if we’re thinking about artists as political consultants, and as the authors of these kinds of events, they then become responsible for this problem, especially considering that artistic critiques are fragile and don’t travel well. DY: If you are asking a question about how change occurs, it does not only coincide with the two elements you mention above – criticism and decision making (voting) – but in many other necessary processes, such as developing new methods of speaking and acting. I am not sure that your critique and thus your reading here allows space for duality and other strategies of acting together. However, I guess you are also asking another question: if you reaffirm what exists in the public realm anyway, what is the point of the artistic effort? EF: Or how can artistic critique become translatable? How can the experience of the gala become part of the lasting impact of the project as a whole? DY: I think the way that people reacted on the evening itself is not necessarily the way that they felt about it in the days and weeks after the event. For example, it was such a long negotiation with the Imam to have alcohol in the room – since when would you have the head of a mosque sitting next to a bottle of wine? Those elements that I’m trying to refer to, these many small conflicting positions and disagreements, were an important aspect of this project. Some conflicts were better resolved, some stayed as they were. It was a confrontation between different publics, each of which could accommodate certain elements and could not accommodate others. But feeling them shift and move produced, at least for me, a sense of hope. Movement is possible.